As a result of the efforts of Indian Space Research Organization to develop a processible polyimide, a prepolymer having excellent processability, stability at room temperature and with moderate cure temperatures was developed. Composites made from this prepolymer have yielded components for space and aerospace applications. ABRON-R 750 is being manufactured by A B R ORGANICS LIMITED with the license from Indian Space Research Organization. ABRON-R 750 is highly amenable for polar & filament winding technology also. The prepregs made from ABRON-R 750 have a long shelf life of 3 to 6 months at room temperature. Silica/Glass/Carbon cloth is impregnated with the resin solution. The solvent is allowed to evaporate (at 55 – 60°C when DMF is used as an solvent). The prepreg should have resin content of 35 – 40% weight. The tack & drape of the prepreg is controlled by adjusting the residual solvent content. The prepregs are stacked in mold and heated to 120°C and held for one hour under 60 psi pressure. The mold temperature is raised to 160 – 165 °C as a second step and maintained for another hour. Final cure is done by heating the mold to 200 – 220 °C for 2 hours under pressure. 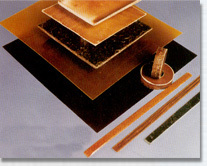 The laminate is released after cooling under pressure to 80 – 100 °C. Post curing is to be done at about 125 °C for 6 hours. This procedure, however is not same for all shapes and thickness of laminates. The exact cycle has to be determined based on trials. The above properties meet the requirements of composites functioning uptoo 220°C and at 400°C for short duration application. Value obtained after soaking the sample for 100 hrs at 200°C.